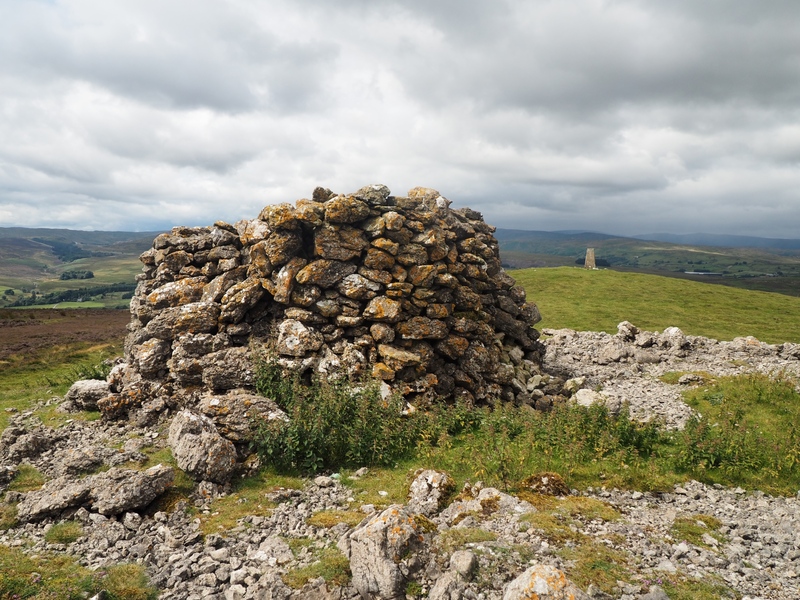 A fascinating walk exploring Crosby Ravensworth Fell visiting the summit of Long Scar Pike and numerous other features including stone circles, an old Roman road and a 17th century monument. The Orton Fells are a series of modest limestone hills that run east to west between Kirkby Stephen and the M6. While I’ve done several walks in the area over the past decade I’d never got round to visiting Crosby Ravensworth Fell despite it being on my to do list for sometime. With the imminent expansion of the Yorkshire Dales National Park due to take place on 1st August it seemed an apt time to finally do this walk. Joining me again on this walk was Paul and, after meeting at our usual place in Middleton Tyas, he drove us both to Crosby Ravensworth where there was a nice parking area opposite the village hall. Walking south out of the village we left the road at Town Head to take a good track to climb up a thin strip of access land that rejoices in the name of Slack Randy. Even at this early stage of the walk there were good views north to the East Fellside of the North Pennines with High Cup Nick in particular a striking feature. At a fork in the track we took the left option to continue climbing gradually on to the grassy moor. While there were patches of limestone to be seen there were also isolated boulders of Shap Granite scattered about. At White Hags we made the first of a number of small detours to visit a stone circle made up of small granite boulders. From the stone circle we didn’t return to the path but instead contoured up towards the head of the Lyvennet valley aiming first for a particularly large granite boulder and then on to the Black Dub monument. This small obelisk was erected to mark the stopping point of Charles II and his army of Scots in 1651. The monument features an inscription and carvings of a seated lion, a crown and a figure that looks more like a Roman emperor than a Stuart king. Next we walked up to the ancient cairn on Howenook Pike where there was a good view east towards the other Orton Fells, also for the first time the Shap Fells came into view to the west. After taking a few photos we dropped down to a shooters hut and crossed over a path that at this point coincides with Wicker Street, an old Roman road that connected Kirkby Thore and Low Borrowbridge. A brief pathless climb up through the gently purpling heather brought us to Long Scar Pike, the highest point of Crosby Ravensworth Fell. The prominent summit features two grassy knolls, one topped by a trig point, the other by another ancient cairn. The overall panorama was superb and included the Howgill Fells, Lune Gorge, Shap Fells, Far Eastern Fells, North Pennines and the hills above Mallerstang. Perhaps less impressively the summit also looks down on the M6. After taking an early lunch to enjoy the views longer we left Long Scar Pike heading north-east until we reached the track heading north for Oddendale. Along the way we made another detour to visit the Oddendale stone circle, this one featuring a second inner ring of granite stones. From the road end at Oddendale we took the path crossing the entrance to Hardendale Quarry before striking up on to Hardendale Nab. There was once a trig point up here but it seems to have been quarried away some time ago. Indeed the summit area seems to have been completely reshaped and bore little resemblance to the printed map I had with me which is just 11 years old. Although there was no trig point, Hardendale Nab did have an interesting quarried ridge on the summit just north of which were three cairns with a fantastic view of the Far Eastern Fells of the Lake District. Leaving Hardendale Nab we dropped down to the road at the northern end of the large quarry lake to then climb on a briefly enclosed way on to Iron Hill where there was a semi-circle of granite boulders. A short distance to the south was another small stone circle. After dropping down alongside Haberwain Plantation the walk concluded with a nice descent along Haberwain Lane and more superb views of the North Pennines. All in all this was an excellent walk, there were numerous features of interest and the views, particularly from Long Scar Pike, were superb. The area is certainly a worthy addition to the Yorkshire Dales National Park even if histrorically it was in the middle of the county of Westmorland. As ever, an enjoyable report. Still haven’t got my head round the extended Yorkshire Dales! Thanks Bernard. Me too, some of it kind of makes sense but in other ways it erodes even further the area’s historic identity as Westmorland. Also seems to be a bit odd considering Nidderdale is still not in the National Park.